The next Total Lunar Eclipse is set for February 20th. Here on the West Coast it will reach exactness at 7:32 pm, while on the East Coast it will be manifest at 10:32 pm. Try to get out there and see it because there won’t be another total one until 2010. A really excellent web site to get all the astronomical information and full-model diagrams on eclipses is MrEclipse.com. I’ve seen many an eclipse in my years, but the most memorable sighting was one cold November night on a high mesa outside of Santa Fe, New Mexico. The air was crystal clear and the moon was high in the sky. Watching it gradually turn into a blood red ball was a thrill. Seeing that three-dimensional orb in the sky brought such a strange and vivid sensation of standing on a ball in space myself. So if you can go somewhere away from city lights and really just stand on the earth and watch a Total Lunar Eclipse, you’ll have a truly visceral experience of ‘being in space’ yourself. I see that Borrego Springs is advertising a Lunar Eclipse Barbecue. Check it out at borregospringschamber.com. This Eclipse is following our Annular Solar Eclipse of last February 6th, however we are about to move into Pisces, so the Moon will be in Virgo opposite the Sun in Pisces at 1 degree and 53 minutes. This particular polarity speaks of a need to connect with the world and her suffering, but to also address it with faith and a willingness to serve or take some kind of positive action to alleviate pain or sorrow. If we each do our part right where we are, much can be done collectively to make this a better place for all of us. Remember, a Full Moon Eclipse is symbolic of a blotting out of the Lunar Force. It’s a very good time to let go of conditioning that inhibits further growth into your future. If old habits are preventing you from fulfilling your intention to move forward, you can more easily release such habits and create better rhythms for yourself that support your goals and aims. Look to your own birth chart to see where this particular Lunar Eclipse polarity falls. What house does the Moon connect with? This is the area where you can let go of the past, if you so desire. The house where the Sun falls in is where you can forge a new direction. With the Sun in Pisces illuminating that field of experience, you can allow a greater flow of light to permeate and uplift you over the next several weeks or months. 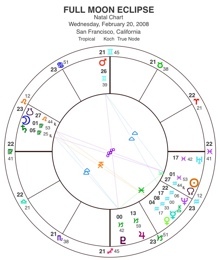 Let’s use as an example a chart where 1-2 degrees Moon in Virgo falls in the 1st house of Self-Identity and the Sun at 1-2 degrees of Pisces falls in the 7th house of Partnerships. The Total Eclipse seems to indicate that this individual has the possibility of releasing any self-critical, inhibited views of self-identity and allowing a greater flow of union and compassion to arise within the context of their partnerships. Simple enough? 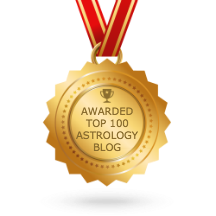 Let’s look at one more example: say an individual where the eclipsed Moon in Virgo falls in their 9th House of beliefs, philosophy, and world view, while the Sun in Pisces falls in their 3rd House of mind-set and attitude. This Eclipse could allow for a release of limiting and bigoted belief systems so that a greater more open-minded attitude, embracing the views of others, could lead to a truly global perspective. In Summary: try to get outside and really experience the eclipse for yourself, especially if the night is clear. Work with the eclipse to release the past, in a favorable and healthy way, in order to embrace more fully your future goals and aspirations. And finally, enjoy it. Woo Whee, it’s free!